A repost about Stephen Strange and Morganna Blessing and Clea. ENTERTAINMENT WEEKLY released some pictures from the Benedict Cumberbatch DOCTOR STRANGE movie. Rachel McAdams will be in it, but will she be playing Morgana Blessing? And who is Morgan Blessing, you may ask? During an attack on GI Joe headquarters Cobra Commander and Destro wind up missing and presumed dead, however they are alive and making their way together in civilian disguises. GI Joe ARAH -27 & 84- Snake-eyes', Zartan's and Cobra Commander's bitter past. In this post: Scarlet meets Snake-eyes for the first time, Storm Shadow address the accusation that he is to blame for the Hard Master's Death, the real killer's motive, and the birth of Cobra. Do you miss Eclipse Comics? I certainly do. 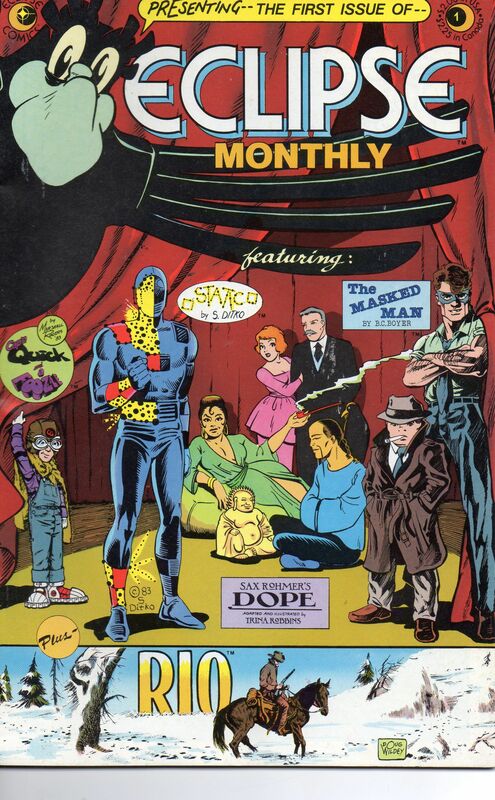 Let's lookl at the first issue of Eclipse Monthly, their first color anthology comic. Three pages each of four ten-page stories, and two pages of a six-page story. WARNING: "Dope" is an adaptation of an early Sax Rohmer story, and has period racism. In Which I Talked to Deconstructing Comics About LULU and more. Five months after the smash hit release of the Tim Burton film, a new Batman comic strip ran in newspapers from 1989 to 1991. Following the film in spirit but set in an entirely new continuity, the first storyline was written by Max Allan Collins (Road to Perdition, creator of Post-Crisis Jason Todd) and illustrated by the late, great Marshall Rogers (Batman: Strange Apparitions, which still looks stellar today). I've fallen head over heels in love with this comic strip. 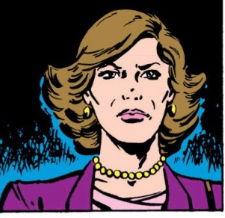 Naturally, my love doesn't really kick in until Harvey Dent becomes a major supporting character in the next storyline, which may be one of the most original and interesting takes on the character I've seen anywhere, in any medium. I actually suspect that it influenced the creators of Batman: The Animated Series. But even from the start, I love how Collins (and his successor, William Messner-Loebs) didn't try to simply regurgitate the old stories for newspapers, but came up with distinctly different characterizations, origins, and plots, while the stories themselves feel completely divorced from comics of any era. They're fun, suspenseful, moving, and occasionally, even a bit on the cracky side. Coming up next, the new creative team of Messner-Loebs, Infantino, and Nyberg bring us the Penguin, Batman's mysterious new British sidekick, and a refreshingly different take on Harvey Dent, D.A. (how do you like THOSE credentials, Rex Morgan?). First things first: who here *hasn't* read the Batman story arc Strange Apparitions (the legendary comic arc by Steve Englehart, most famous for including the all-time great Joker story, The Laughing Fish)? If you haven't--or if you've only read Fish on its own but not the surrounding story--you should at least know that it's generally considered one of the finest Batman stories of all time. I certainly agree, but I don't want to oversell it as a work, since hyped expectations have killed many a great story. 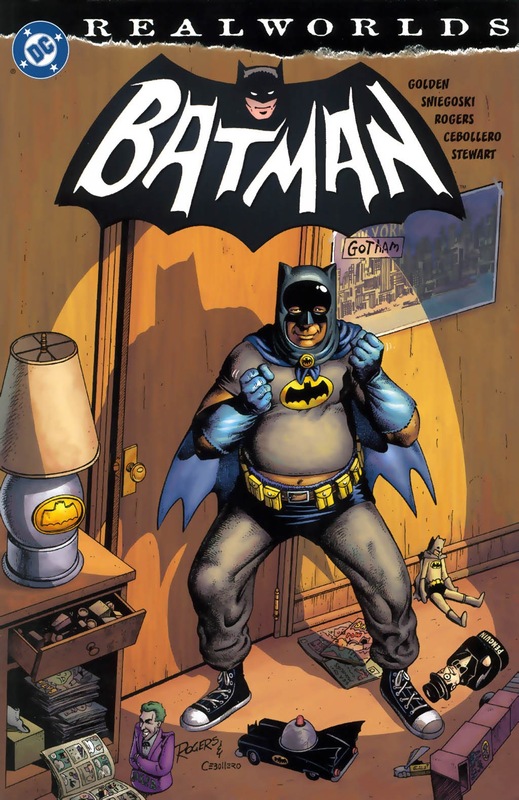 I can at least safely presume to call it one of the most important and influential Batman comics of all time, and for that alone I urge you to track down the trade paperback. Or at least, I would, if it weren't out of print. WTF, DC? I was actually tempted to post the entire storyline here, but I had a hard enough time singling out the Hugo Strange subplot while keeping these scans under the 1/3rd limit. The story is just that tight, with each issue packed to the gills with plot, action, and character stuff. So with regret, let's eschew the excellent stories of Bruce and Silver St. Cloud's affair, of the introduction of Dr. Phosphorus and the reintroduction of Deadshot, of the thieving Penguin and tragic Clayface III, and even of the greatest Joker scheme of all time. If you'd like to read all of Strange Apparitions yourself, I wish you the best of luck. As previously stated, this beloved classic is bizarrely out of print. If you're up for scouring back issue bins and/or the internet, the story's been collected in trade paperback, which itself is a collection of the five-issue miniseries Shadow of the Batman, which reprinted the original issues. Basically, find it any way you can until DC comes to their senses. "Morgana Blessing was the sort of woman that Doc would have had a relationship with, in his previous career as a high-priced surgeon. She was the Earthly love, in contrast with the ethereal, extradimensional Clea. All the regular readers loved Clea, of course, but the relationship she and Doc had was not exactly an enlightened one. If Clea had just been Docs lover that would have been okay, but shed also become his student, his disciple. It was a case of I love you, Clea. And I love you, Master. And not in a sweet, innocent, I Dream of Jeanie way, either. Not a healthy relationship, not healthy at all." The first meeting, and a panel from the ILLUMINATI miniseries after the cut. You know I looked it up and there have been 4 different "Madame Xanadu" books ? From DR< STRANGE #49. Villains do nasty things. Killing a new character's cat in order to disguise yourself as said dead cat is EXTRA nasty. dustbunny105 requested the Batfamily being familial.